EUR1, also known as an ‘EUR1 movement certificate’, is a trade document, which allows importers located in European Union or countries with which the EU has signed a Free Trade Agreement, to import goods at a preferential import duty. Example 1 : How does EUR1 certificate help importers in EU to pay lower import duties? Importers located in European Union have to pay 11,5% import custom's tariff when importing fresh table grapes from a 3rd country with a standard certificate of origin. But the same German importer would pay no import duties when importing fresh table grapes from Egypt with an EUR1 movement certificate. German importers pay zero custom duties for the fresh table grapes they imported with EUR1 movement certificate. Example 2 : How does EUR1 certificate help to keep exporters in EU competitive? Importers located in Mexico have to pay 15% import custom's tariff when importing household refrigerators from a 3rd country with a standard certificate of origin. But the same Mexican importer would pay no import duties when importing household refrigerators from Germany with an EUR1 movement certificate. 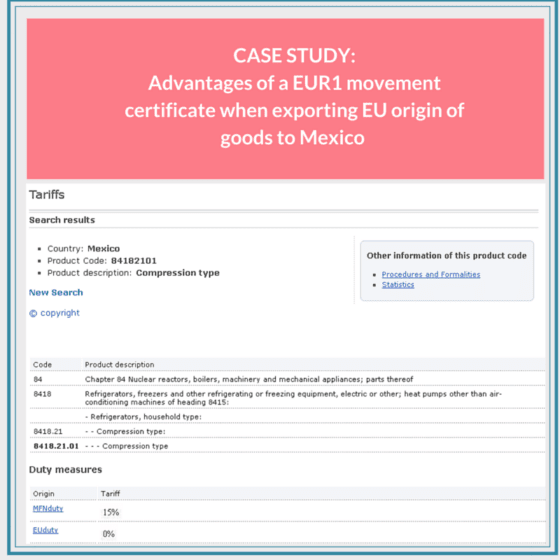 Mexican importers pay zero custom duties for the EU origin household refrigerators they imported with EUR1 movement certificate. When to use EUR1 movement certificate instead of an ordinary certificates of origin? EUR1 movement certificate should be used in export and import transactions between European Union countries and the countries with which the EU has signed a Free Trade Agreement. On below table you can find list of countries that the EU has signed a Free Trade Agreement. Regulated through the Cotonou-agreement, which is not a traditional FTA, but rather a non-reciprocal agreement. Who should complete an EUR1 movement certificate? 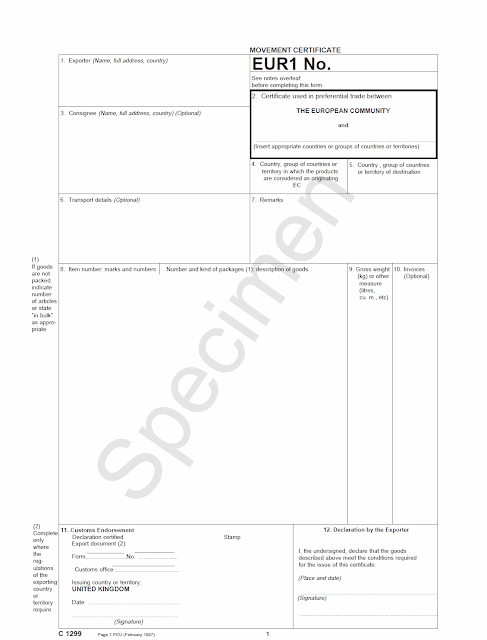 Exporter of the goods should fill the EUR1 movement certificate and sign the declaration stated on the right bottom side of the document, because only exporter could know whether the goods are eligible for the preferential custom duties. Who should endorse an EUR1 movement certificate? EUR1 movement certificate should be endorsed by the exporting country's custom authorities or any other legal organization that is specifically commissioned with this job. What is the validity period of an EUR1 movement certificate? EUR1 certificates issued for exports to EFTA, Algeria, Egypt, Lebanon, Israel, Faroe Islands, West Bank/Gaza Strip, Jordan, Tunisia, Morocco, Turkey, South Africa, Macedonia, Albania, Bosnia-Herzegovina, Serbia, Montenegro and Kosovo are valid for 4 months. EUR1 certificates issued for exports to ACP/OCT countries, Mexico, Chile or a GSP beneficiary country are valid for 10 months. EUR1 certificates issued for exports to all other countries are valid for 5 months. Is it possible to apply for an EUR1 movement certificate after shipment? Yes, it is possible to get an EUR1 certificate to be issued after shipment in some rare conditions. This procedure is known as issued retrospectively.